I've always thought the town has no interest in the railway just want it to protect the town..maybe Netwerk Rail should build a 12 ft wall all along the track or make it a tunnel all along the seafront....that would protect the town but no sea views. 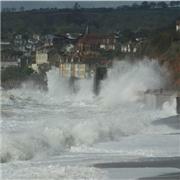 They should build the line the other side of town ..Dawlish Parkway avoid the sea ..it will always win! Why the heck don't they just give up on the line by the sea! ...get building Dawlish Parkway other side of town...or build a tunnell between the town and sea.. do you want a blocked view of sea and get town protected?.. I don;t think the town is that bothered on a rail service really..
Will have to stop the line at Dawlish Warren for Dawlish. Chucking money at the wall to be washed away is crazy. Open an inland line to Newton and yes Okehampton- Plymouth makes sense. So there is no answer to it then ..just wait until the line is totally washed away. Line westwards would end at Dawlish Warren for Dawlish. Best get the Okehampon line open to get to Plymouth and Cornwall. As for their idea of putting the line nearer the sea has to be the most bonkers idea! One day someone will come with an idea of putting the line inland away from the sea ....Dawlish Parkway! GWR didn't run when the line collapsed into the sea!